In 1991 George Rodrigue’s printed artwork bolted forward with new color and precision as he applied the latest in ink and technology to his silkscreens. This was a substantial advancement over his earlier Cajun posters and Blue Dog silkscreens. For the first time he created complex original print designs using intense hues. 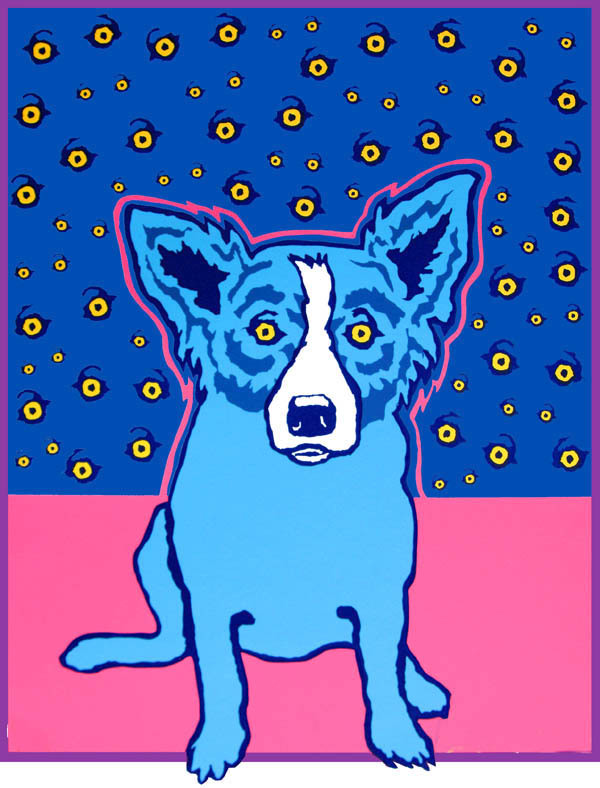 Prior to the silkscreen Starry, Starry Eyes (1991, edition 175), Rodrigue’s Cajun posters were four-color, offset lithographs. His Blue Dog silkscreens were two or three colors, dull in shade and thick in texture, as he experimented with silkscreen ink. He guessed at colors and struggled with splattered paint, scratches and dings, sometimes pulling as many as thirty trial prints to obtain a final artwork without damage and in perfect registration. With Starry, Starry Eyes, Rodrigue swaps paint for ink and hand for machine. He experiments for the first time with the computer, increasing the complexity of his designs and, because his silkscreen prints transfer from his mind to his paper without an intermittent painting, allowing him to see the final image and make changes before his printer produces the work. 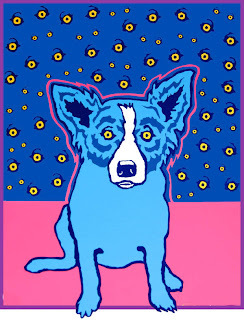 Starry, Starry Eyes became Rodrigue’s bestselling print to date, despite its $350 price, a staggering amount at the time. A victim of backyard familiarity, the New Orleans gallery sold only a handful of prints to locals – a pattern that began years earlier with his Cajun paintings, as a surprising two percent of his collectors even now are Louisiana residents. We shipped worldwide, and the gallery phones rang non-stop for weeks, long after the prints sold out. This was remarkable in those pre-email days, because, other than New Orleans and Carmel gallery foot traffic, we relied on photographs and the U.S. Post Office. We produced our first high quality mailer, a tri-fold piece with die-cuts, overlaying the eye-filled sky on the dog. Today these mailers are a casualty of the computer age, as we dismiss the delay and expense in favor of digital photography, websites and facebook. 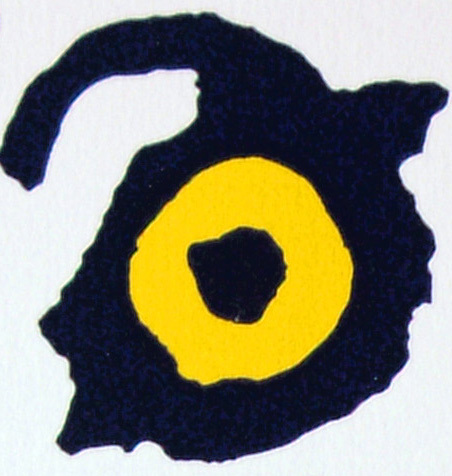 It is the Blue Dog’s eyes, according to many enthusiasts, that draw them in and create the mystery. Early on Rodrigue changed the loup-garou’s red eyes to yellow, shifting the dog’s meaning away from the Cajun werewolf legend. In time the oval dog-like eyes become unnatural round saucers, uniform in their structure and hue, shifting the artwork’s meaning again, this time away from real dog associations. “Without variation in shape,” explains Rodrigue, “one would think these round saucer eyes would cause a static expression. But this is not the case. The other elements in the dog’s face become very important. In changing those elements, even slightly, in relationship to each other, the dog’s expression varies. It was a gift from artist Mallory Page that started this week’s discussion of eyes, reminding me of Rodrigue's Van Gogh salute. 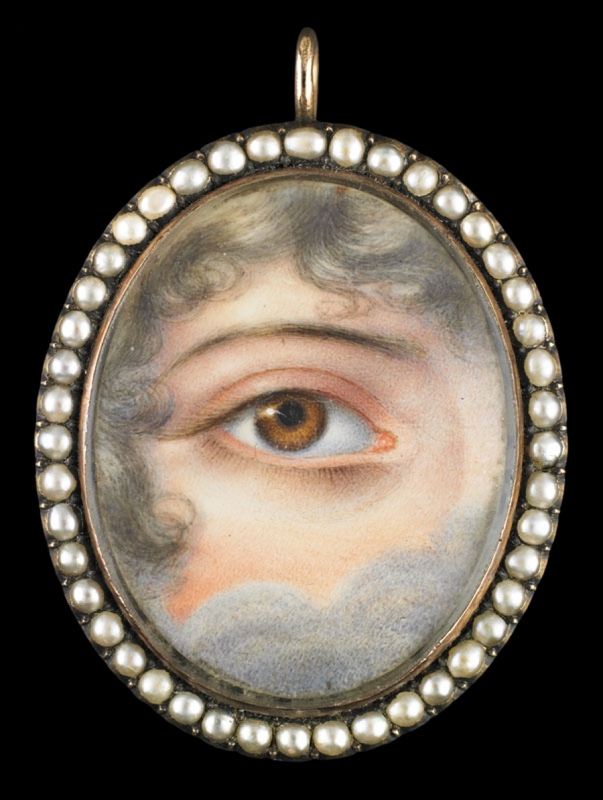 The book, The Look of Love (Graham C. Boettcher, 2012), features late 18th and early 19th century eye miniatures from the Skier Collection, the subject of a recent exhibition at the Birmingham Museum of Art. 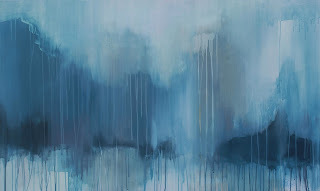 “It’s pure romance,” says Page, known for her own emotive paintings, as she reveals her heart not through a painted gaze but through abstraction and color. I asked George Rodrigue about the importance of eyes in expressing emotion; yet he dwells on character, referencing the timeless stares within his Aioli Dinner, the crazed gaze of Earl Long, and the unwavering strength of General Eisenhower. Even as I write this post, however, he creates within his computer an eye portrait, sending me his own look of love, a cyber age keepsake. In twenty years an artist’s world shifts from paint to ink, from hand-pulled to machine, from guesswork to computer, from elaborate brochures to digital photographs, from snail mail to email, and from a traditional secondary market to…. 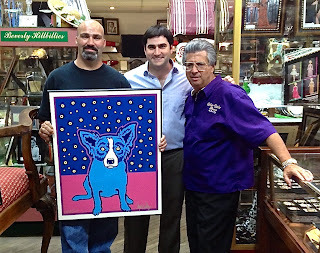 This week George’s son Jacques Rodrigue appears as a guest on Cajun Pawn Stars when a customer enters with, you guessed it, Starry Starry Eyes. “It was great visiting with Jimmy, a true Louisiana character," says Jacques about his experience. "He’s always liked my dad’s artwork. Tune in this Wednesday, July 11th 2012, for Cajun Pawn Stars and the continuing story of the classic Rodrigue silkscreen, Starry, Starry Eyes. If you can't be locked in the Asylum at St. Remy, and you can't have Don McLean crooning you into oblivion, you might as well lose your mind watching great art meet crazy reality television. Mon dieu!!! Hi my name is Nicolas, im from Argentina. A few months away i was watching Cajun Pawn Stars and automatically felt in love whit that illustration. Since then i cant get off my mind that little blue dog. I would love to have one copy but the economy of my country wont let me afford that amount of money. I hope one day i could have an Starry, Starry Eyes on my collection. My best wishes for the artist and his family!